The idol recovered from the Tibetian couple is believed to be of 12th century AD, having reverence of highest order in the Buddhist religion world over. Its value runs into several crores of rupees in the international market. The value of the 900-year-old Buddha statue runs into several crores of rupees in international market. 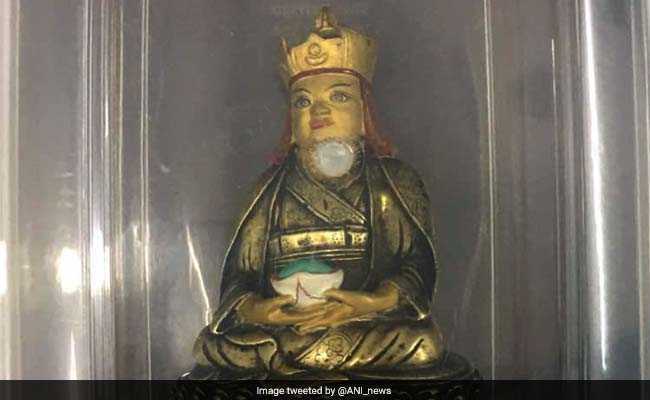 New Delhi: A Tibetan couple was arrested on Monday from north Delhi's Majnu Ka Tilla area for trying to sell a 900-year-old idol of Lord Buddha which they stole from Tawang district of Arunachal Pradesh. Police said the couple -- Ngawang Tsundue, 29, and his live-in partner Lobsang Gakey Sherpa, 26 -- were arrested around 10.30 am by a team of Crime Branch officials during a raid on a tip-off. The couple had come to sell the stolen idol to a prospective buyer for Rs 1.40 crore near a Gurudwara in Majnu Ka Tilla area. Tsundue is a resident of Kangra in Himachal Pradesh, while Sherpa stays in Punjabi Basti in Majnu Ka Tilla area, according to police. "On the intervening night of May 31 and June 1, Tsundue stole the idol of 'Terton Pema Lingpa' from the house of head Cheepa of Sangyeling gompa in Tawang of Arunachal Pradesh. A major socio-religious unrest was brewing up in the state over the incident," Deputy Commissioner of Police Madhur Verma told news agency IANS. "Police teams received a tip-off on June 4 that the racketeers involved in the theft of idol having high religious and spiritual value are trying to sell it in the grey market in north Delhi. The complainant also said that the idol would be smuggled to Tibet for monetary gain," Mr Verma said. The idol recovered from Tsundue and Sherpa is believed to be of 12th century AD, having reverence of highest order in the Buddhist religion world over. Its value runs into several crores of rupees in the international market. "On interrogation, Tsundue told the police that he is a permanent resident of Tibet and came to India in 2009. He then started living in Dharamsala in Himachal Pradesh where he came in contact with the daughter of head Cheepa of Tawang-located gompa in Arunachal Pradesh. He later married her in 2011," Mr Verma added. "Tsundue said his marriage did not last long and they divorced. Since then he was having enmity with the head Cheepa's family. As he was aware of the idol of Terton Pema Lingpa in his house, he stole it to get monetary gain and to defame head Cheepa," the officer said.